Close encounters of the violent kind. Six hundred years after the events of Mass Effect 3, the Hyperion arrives in the Andromeda galaxy. This mile-long Ark ship is home to 20,000 humans, and as it approaches Habitat 7—an Earth-like planet earmarked for colonisation—the crew is awoken from cryogenic stasis. You’ll spend some time exploring the Ark before you arrive at your new home, meeting characters including future squadmates Cora Harper and Liam Kosta, and Alec Ryder, your father. You’re also introduced to the scanner, a device used to analyse the bizarre technology, flora, and fauna you’ll discover as you explore Andromeda’s planets. While Shepard had EDI, you have SAM. He’s an advanced artificial intelligence who will try his best to explain the things you scan, whether it’s a giant fluorescent mushroom or a weird dog that can inexplicably turn invisible—just two of the things I encountered on my first planetary expedition. Our Mass Effect: Andromeda news hub has a whole lot more Mass Effect for you, including another article about the first hour of the game and news about the endgame and level cap. The Hyperion arrives at her destination and Habitat 7 looms into view. But far from the idyllic, temperate world humanity was expecting, it’s a bleak-looking place ravaged by electrical storms. And to make matters worse, the ship gets caught in a tangle of strange energy surrounding the planet. Vine-like tendrils wrap around the hull and the Ark is stuck in place. But without the option to turn back and go home, we have no choice but to land and determine its suitability for a colony. Humanity’s chosen Pathfinder, Alec Ryder, takes a small crew—including you, Kosta, and Harper—aboard a shuttle and travels to the surface. The shuttle is tossed around by the maelstrom raging in the atmosphere, and crashes on the surface, scattering the crew and separating you from your father. And this is where Mass Effect: Andromeda really begins, on the surface of a hostile, storm-battered alien world. This is it, I think. First contact with a truly alien species. A moment of enormous historical importance. The planet looks vaguely like Earth, except for the massive chunks of rock surrounded by crackling arcs of electricity floating in the sky. And although our intel—which, admittedly, is now six hundred years old—said the atmosphere would be breathable, it isn’t, and we have to keep our helmets on. Something has happened here recently, and the presence of an immense monolithic structure far in the distance only adds to the mystery. But before I investigate I need to regroup with the crew. With Kosta and Harper in tow I make my way through a series of caves and swamps, dodging floating rocks and stray bolts of lightning. It feels like the planet is being ripped apart by some immense force. And then, in the distance, I see something moving. This is it, I think. First contact with a truly alien species. A moment of enormous historical importance and I'm witnessing it first-hand. First contact with another species has been firing the imaginations of writers for years, and it’s the basis of some wonderful science fiction moments. Communicating with light and music in Close Encounters of the Third Kind. Using symbols to learn an alien language in Arrival. Dave Bowman going beyond the infinite in 2001: A Space Odyssey. Humans meeting Vulcans for the first time in Star Trek: First Contact. These are stirring, evocative moments that, like the best science fiction, say as much about us as a species as the creatures we meet. And that's what makes your first encounter with intelligent creatures in Mass Effect: Andromeda such a disappointment. The shapes I see moving in the distance are the Kett, an antagonistic race of scary-looking creatures covered in organic bone armour. Something interesting may be revealed about their culture, history, or motivation later in the game, but their appearance leads me to believe they're Andromeda's equivalent of the Collectors in Mass Effect 2. One-dimensional monsters to be shot at. They’re surrounding the flaming shuttle wreckage, armed with high-tech-looking rifles, and are about to execute a bloodied survivor. And so my first encounter with another intelligence in a distant galaxy is shooting at it. I pin myself against a conveniently waist-high rock for cover and kill both Kett with my pistol. When the dust settles, Ryder makes a throwaway comment about having no choice but to attack, which is true, but doesn’t make the moment any less deflating. Mass Effect is, fundamentally, about two things: shooting and talking. And I wish they’d chosen the latter over the former for this moment. A tense, dramatic standoff with a species whose planet you’ve just landed on uninvited. Ryder having to talk his or her way out of a dangerous situation, convincing them that we really do come in peace. Or any number of interactions more interesting than shooting them with a gun. But, alas, violence is the first mark humanity makes on Andromeda. I’m sure there’ll be more meaningful, dialogue-driven interactions later in the game, like the Wrex/Kirrahe standoff in the original. But first contact should have been more special. Everything leading up to meeting the Kett is brilliantly done, particularly your dramatic descent in real-time from orbit to the surface of the planet. But after that you regroup with Alec and fight your way through hordes of Kett, all the sense of wonder, fear, and anticipation that should come with landing on a distant, uncharted world is stripped away. The combat is fine—a marked improvement over the original trilogy, while still feeling familiar—but I would have liked more time to explore and reflect on the immense journey Ryder has just taken. This could be by design, of course. A baptism of fire, letting you know that life in Andromeda won’t be easy. But if that’s the case, it didn’t quite work for me. The game passed up a potentially great sci-fi moment for what is essentially a combat tutorial. Even so, I can’t wait to get my hands on the finished game. What makes Mass Effect special for me—something I didn’t get much of a taste of in this short demo—is forming relationships with my companions over the course of the game. I’m looking forward to getting to know Ryder’s crew, discovering what makes them tick, and learning about them through their loyalty missions, which are confirmed to be returning. I always enjoyed wandering the Normandy and talking to everyone after a mission to get their perspective on things, and I hope I'll get to do the same on Ryder's ship, the Tempest. 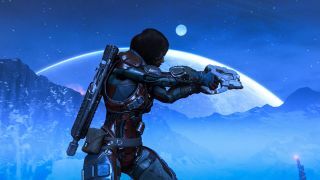 Andromeda feels very different from Shepard’s trilogy, and I’m constantly reminded of Dragon Age: Inquisition as I play. But it’s still identifiably Mass Effect. I just hope there’s more to discover out there than a variety of aliens to shoot at, and that humanity has something to bring to this new galaxy other than aggression. I mean, I know that’s what’s defined us for centuries, but surely it’s time to buck the trend. We’ll find out for sure when Mass Effect: Andromeda is released on March 21 in the US and March 23 in Europe.